It's so nice to spend a weekend in summer relaxing, enjoying the sun and the breeze, and not doing any of the things you told yourself you'd take care of over the weekend. 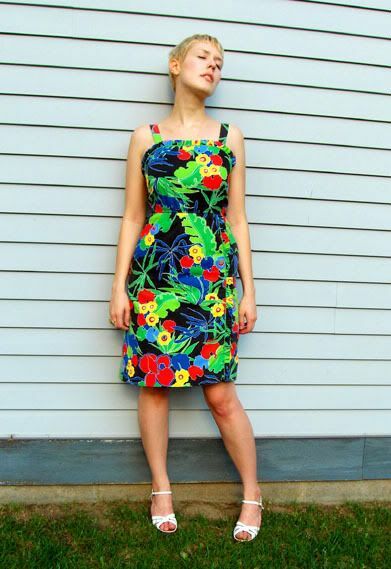 What I really dig about this 80's cotton summer dress is the ruffling along the faux wrap hem. It gives it that extra "vacation in Hawaii" feel. 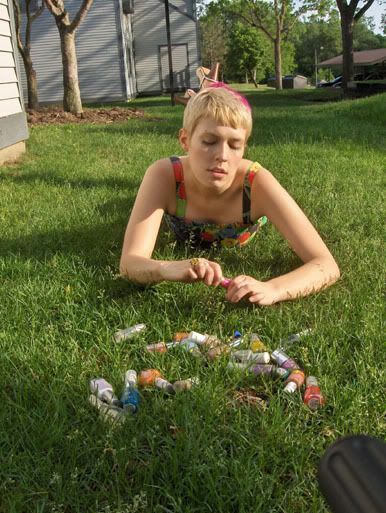 And on an unforgivingly hot summer day, who can resist a long awaited nail touch-up in the grass, just to see if sitting with all those little "flammable" warnings under the blistering sun will cause you to burst into flames. Whoa what a print! You don't need the sun when you've got a dress like that. Breathless! Cool print, cool girl! such bold colours very beautiful! Loving the dress! The print is just gorgeous. Great dress, and I wish I had as many lovely nail varnishes as you! great dress for a summer's day! Cute, very cute. Love your hair, wonderfully pulled together look. Whoa that dress is very bright! I love it though. The bold colors look great on you, and go together well. I absolutely love that dress and it looks great on you! Sounds like a perfect weekend of procrastination! I had one of those too. That dress is WONDERFUL. No need for accessories. that dress is like a fruit punch! plus i have another black dress with green belt, should i go with the purple or red shoes? Cammila, you look great in the dress! It looks style and comfy! I love the frill details down the side, very chic and pretty! I also pretty wider shoulder straps on the dress, it looks very comfy! you look fantastic, like a breath of fresh air. and thank you for another highly thoughtful and thought-provoking comment the other day. will be adding you to my links now right now..
those colors are amazing on you! 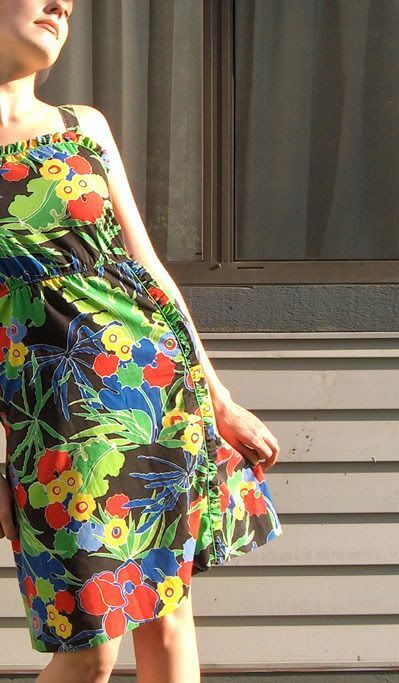 i adore your printed dress! You could never be grumpy in that dress! It looks so good on you. that dress is amazing, oh wow oh wow oh wow. i'm very easily fooled by nail varnishes, the cheap ones are always the best colours...but then they chip in minutes. That dress is amazing! Bright florals, I love it. The dress is absolutely fantastic...a perfect smiley sunny weather outfit!